Historical Background: Philip II of Macedonia built a powerful army and used it to bring all of Greece under his rule. After his assassination in 336 BC Philips 20-year-old son Alexander inherited the throne. Alexander promptly crossed the Hellespont into Turkey intent on conquering the mighty Persian Empire. The first major battle came at the Granicus River. Alexander led his elite Companion cavalry across the river to draw the attention of the Persians. It worked, almost too well. Alexander was nearly killed when the Persians counterattacked, but the tactic worked. Alexanders Macedonian phalanxes were able to cross the river and defeat the Persian army. Alexanders victories would continue and his victorious army would travel as far as India before his death at the age of 33. Alexanders legacy would be the spread of Greek culture and language, and the many cities he founded. Battle 1: In this battle Alexander did not live up to his reputation. At the start of the battle he timidly sent just one unit of Companion cavalry across the river, supported by a unit of archers. The Persian cavalry trampled the advance force before Macedonian reinforcements could be brought across the river. Following this embarrassing disaster Alexander was seen skulking in the rear, and the morale of his army suffered. Eventually the confused Macedonians did cross the river in force. The Persians tried to stop the Macedonian phalanxes with a strong force of archers, but this was hopeless. The phalanxes brushed off the attacks and obliterated the archers before turning their attention to the Persian infantry. They began to slowly grind up the Persian infantry while the Macedonian cavalry fought the Persian cavalry on both flanks. Emboldened by the success of his army Alexander advanced as far as the river, but chose not to cross. His officers were seen shaking their heads sadly. The Macedonian Companion cavalry and Persian cavalry charged each other. The Persians were swept away except for one remarkable unit. The surviving Persian cavalry unit turned around and charged the Companions again and managed to fight their way back through the enemy lines. Satisfied that honor had been served, the Persians crossed the Granicus and were last seen headed towards Alexanders camp, which they planned to loot. In the center the Macedonian attack faltered when Craterus, commanding the phalanxes, was wounded and captured by the Persians. Alexander responded by entering the Granicus, but stopped in the middle of the river and again refused to advance. Fortunately for the future of Western Civilization Philip had built an army that could win in spite of the indifferent leadership of its commander. The Macedonians sealed their victory with a classic hammer and anvil maneuver. The phalanxes pinned and held the Persian army in the center of the battlefield (the anvil). Meanwhile the Companion Cavalry (the hammer) swept in on the flank to deliver the coup de grace. Suddenly the battle was over, and the Macedonians were the clear victors. Battle 2: Alexander led a strong force of Companion cavalry across the river and immediately charged the Persian left wing. A swirling and chaotic cavalry fight developed and commanding officers on both sides were involved in the melees. In the center the phalanxes advanced behind a screen of skirmishers and regular infantry. The Persians attacked them as they tried to cross the river. The Persian counterattack succeeded in bottling up the Macedonian advance and kept the phalanxes out of the fight. Both sides struggled to gain the advantage while fighting in the swift current. The Persians snuck a unit of archers across the Granicus to harass the Phalanx formations while they waited for an opening to advance. On the Macedonian left wing the Allied cavalry crossed the river and were immediately challenged by the Persian light cavalry. Both sides charged and the Persian horsemen were swept away. The Allied cavalry quickly moved to exploit their victory and roll up the Persian right flank. However the Persian reaction was swift, and the Persian reserves in the center were sent to deal with the breakthrough. They were able to salvage the situation and check the cavalrys advance. The Macedonian attack faltered after the loss of Parmenio, their talented commander. For a brief time the Persians held the Macedonians at bay on all fronts, but then the situation began to deteriorate. The Phalanxes were finally brought into action and they began to tear their way through the Persian infantry. The Persians tried valiantly to stave off cavalry attacks on both flanks, but to no avail. The Macedonians won a narrow and hard fought victory. The Armies: The figures needed for the battle are available in 1/72 scale plastics from Hat Industries (Alexander's Phalangites, Alexander's Light Infantry, Macedonian, Thessalanian & Allied Cavalry, Persian Light & Heavy Infantry, Greek Mercenary Hoplites, Persian Light, Medium, & Heavy Cavalry) or Italieri/Zvezda (Macedonian Phalanx, Greek Infantry, Macedonian Cavalry, Persian Infantry, Persian Cavalry). Here are some paper soldiers you can print and use. Two figures were counted on each base. Base sizes were .75" x 1.5" for infantry 1.5" squares for cavalry. 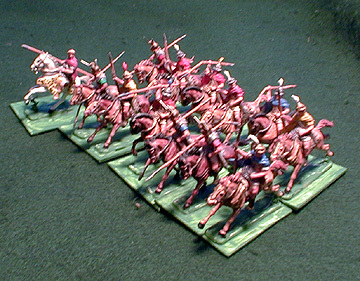 Single cavalry figures were used for leaders and mounted on .75" x 1.5" bases. The Board: The terrain was flat and a 7.5 X 5 foot table was used. The Granicus River must be modeled - it could be drawn with marker, represented by felt, or any method you choose. Deployment: The Macedonian and Persian armies deploy as shown on the map. Historically Alexander led his right wing across the river and onto the Persian left. The Macedonians have the option to try this strategy and deploy Alexander and their right wing across the river as shown on the map. 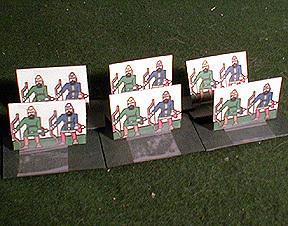 Movement: All infantry units move 6", cavalry move 12". Skirmish units and cavalry may move in any direction. Formed infantry units are limited to wheels and obliques of 45 degrees. Shooting: Only skirmishers and light cavalry (they have bows) are allowed to shoot. Javelins have a range of 6", bows have a range of 12". Roll 1D6 for each base in range. Every 6 is a hit and one enemy base is removed. If any part of a unit is in range the entire unit may fire. Units that are engaged in melee may not fire, and may not be targeted. Charge into Melee: Both sides may charge into melee. This is the only way to get into hand-to-hand fighting. Foot units may charge up to 6", cavalry may charge 12". Units may only charge if they can reach an enemy unit in front of them. If it matters, Macedonians charge first. Melee: Each side rolls 1D6 for each base in the fight. The Melee Table shows the number needed to score hits. Remove one enemy base for every hit. Both sides roll simultaneously. If both units still have stands left they remain engaged and fight again next turn. Last Stand: If a unit is reduced to one stand this last stand is removed immediately. Leaders: Leaders may not be targeted individually. If they are attached to a unit they count as an extra base in melee (but not shooting). If the unit they are attached to loses bases in melee roll 1D6. If the roll is a 6 then the leader is eliminated. Flank Attacks: Units that charge an enemy unit on the flank or rear gain an advantage. The flanked unit may only fight back with two bases. This advantage applies only on the first turn of melee. Crossing the River: A unit crossing the river must end its move with the front rank of the unit in the middle of the river. This unit may not charge during this turn, but the may fight back in melee if charged by the enemy. These restrictions only apply during the turn they are crossing. On the next turn they may move and fight normally. Alexander 334-323 BC: Conquest of the Persian Empire by John Warry, Osprey Campaign Series #7. The best Osprey book I've read so far. Luke Ueda-Sarson's Wargaming Pages website, goes into detail on the battle, and presents two different DBA scenarios. Lots of other useful stuff on this site. 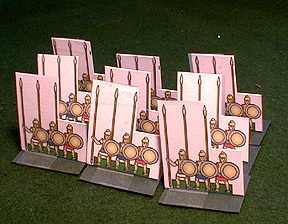 "The Battle of Granicus (334 BC)," another DBA scenario on Chris Brantley's Fanaticus web site.